$6,500.00 Order of Lenin, Type 4, Variation 1 (Durov Type III, Variation 1, Sub- variation 1), #3254, circa early 1937. Scarce version with double-tire screw post base, in very fine condition. $5,600.00 Order of Lenin, Type 4, Var. 2 ("Monetnyi Dvor" screw back), #10153, circa late 1942 issue. A very fine piece never converted to suspension, and with relatively well preserved enamel. $14,500.00 Order of Lenin, Type 4, Var. 2 (screw back version), #13094, with award document, awarded in February 1943 to a junior artillery officer in the Chuikov's 62nd Army for the Battle of Stalingrad. Throughout the defensive period of the battle, he exemplified heroism of the Soviet soldier at Stalingrad - and survived against enormous odds. Nominated for the Title of Hero of the Soviet Union, he received the Order of Lenin as a downgrade, and was also awarded with an Order of the Red Banner earlier during the Battle of Stalingrad. A story of this incredible warrior is conveyed by Antony Beevor in his famous book Stalingrad: The Fateful Siege, 1942-1943. The order is in fine to very fine condition, never converted to suspension and generally an attractive piece despite some damage to enamel. Comes with archival research. $1,695.00 Order of Lenin, Type 6, Var. 1 (Leningrad Mint version with serial number stamped above the lower rivets), #314033, late 1950s issue. In solid 23 K gold and platinum. Superb example in near mint condition. 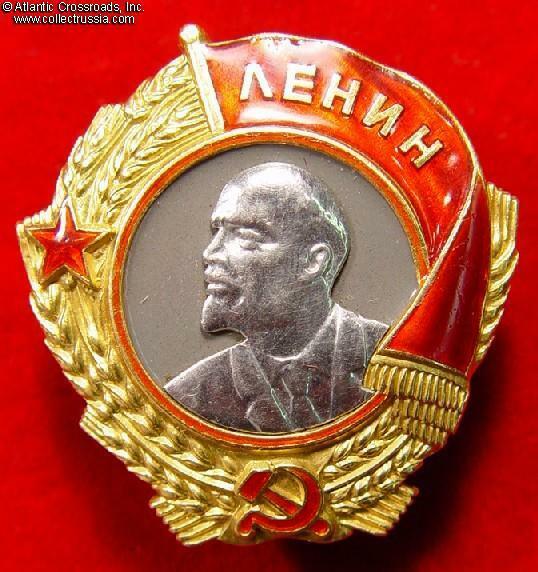 $45.00 "Order of Lenin. Order of Stalin (Project)", Valeriy Durov. C. 2005, Moscow. Large format Russian language hard cover, 143 pp, fine quality. Color detail photographs, front and back, of all known variations, as well as detailed history of the award. Outstanding reference guide to the highest Soviet decoration.